Tópicos: Founding Documents, Constitution, Bill Of Rights, Additional Amendments, e Declaration Of Independence. billofrightsinstitute... 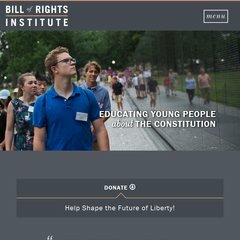 Enter the Being an American Essay Contest | Bill of Rights ..
billofrightsinstitute... Free Lessons for History, Government, Civics Teachers and More ..
billofrightsinstitute... Landmark Supreme Court Cases, Constitution Courier Lessons for ..
Os 2 nameservers são dns1.collage.com, e dns1.insidesw.com. Está hospedado em Blackbaud Inc (South Carolina, Charleston,) utilizando um servidor Microsoft-IIS/7. A linguagem de programação utilizada é ASP.NET. PING 29866a.bbnc.bbcust.com (63.128.9.10) 56(84) bytes of data. O teste de velocidade feito com ping teve um tempo de 50.5 ms.